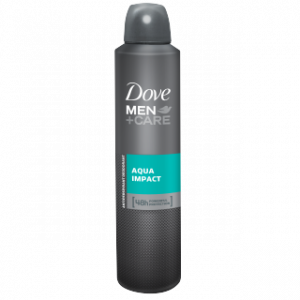 Compare male deodorant brands Brut, Dove, Lynx, Nivea, Norsca, Old Spice and Rexona on value for money, effectiveness, smell of product, packaging and overall customer satisfaction. Canstar Blue research finalised in November 2018, published in November 2018. Sunsilk has topped Canstar Blue’s customer ratings for conditioner, achieving five-star reviews for overall satisfaction, hair softness and packaging design. It leads the way from 13 other brands. Deodorant can be one of those things you don’t take much notice of until you don’t have it. Often taken for granted, deodorant can save us from having an absolute stinker, especially in the summer months. It may be something of a running joke for young men to find deodorant under the Christmas tree, but it’s better to be loaded up than have none at all. If you don’t receive deodorant for Christmas (or you run out before Christmas comes around), there’s no shortage of options when you walk down the supermarket aisle, with numerous brands filling the shelves with a variety of smells, containers, and specialised products. While some of us may turn our noses up at some brands, a good deodorant can prove the difference between smelling like a rose, and smelling like something a little less favourable. But with so many options available, which one you end up putting into your shopping basket can end up a bigger decision than initially planned. 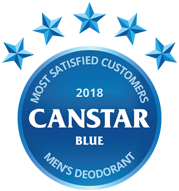 Thankfully, Canstar Blue’s 2018 deodorant ratings can help. We’ve surveyed almost 1,000 men to find out which deodorant brand is the best-rated in Australia. If anyone knows about deodorant, it’s hard-working Aussie blokes! Brut scored a clean sweep in the ratings, with five stars across all survey categories. Old Spice and Dove got four stars overall, with the rest having to settle for three stars. With 35% of survey respondents unaware of the difference between deodorants and antiperspirants, it seems there are a lot of shoppers buying the wrong product, meaning they’re still having problems with sweat or body odour. Odour comes from the reaction between sweat and bacteria, with sweat itself not containing any odour. As a result, deodorants aim to mask odours, while antiperspirants look to prevent sweating. While both achieve the same result – you not creating a stink – they achieve it by attacking the problem from either side. Most brands advertise a ‘2-in-1’ solution, meaning you’ll be able to get the most protection from sweat and odours. If you’re prone to sweating, antiperspirants should be more effective. But if body odour is a problem, deodorants may give you some respite. With 29% of blokes in our survey admitting they suffer from excessive sweating, knowing the difference between antiperspirants and deodorants could help. An Australian brand currently operating under Pharmacare, Brut offers more than just deodorant for consumers, including bathroom products such as shower gels and shaving lotions. Readily available in both supermarkets and pharmacies, Brut has roll-on and aerosol deodorants, as well as 2-in-1 antiperspirants for those looking for more protection on those warm days. Easily spotted with its distinctive green packaging, Brut offers regular deodorants, as well as long-lasting and sports varieties, with aerosols commonly sold in 150g cannisters. Roll-ons are commonly found in 50ml containers. Brut was rated five stars across all research categories, including smell, effectiveness and overall customer satisfaction. Usually thought of as something your grandpa wears, a recent marketing resurgence has seen Old Spice become a popular option for lots of Aussies of all ages, with the American brand selling several types of grooming products, including body wash, shampoos, styling products and deodorants. Found in both the supermarket aisle as well as at your local pharmacy, Old Spice deodorants come in both aerosols as well as classic roll-ons, each with a number of scents and cannister sizes to suit your personal preference. Old Spice additionally lists the ingredients used in its products on its website, making it handy for those with allergies or those concerned about chemicals. 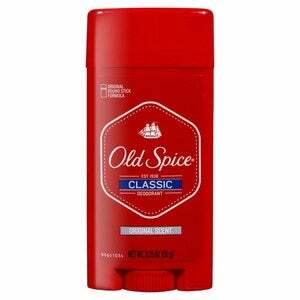 Scoring consistent results, Old Spice was rated four stars across all categories, including value for money and smell. A global personal hygiene brand, Dove offers plenty of products for all your grooming and toiletry needs. Steering away from deodorant or antiperspirant-only products, Dove instead goes down the 2-in-1 path, aiming to give consumers the best of both worlds. Roll-ons and aerosols can be found in supermarkets and pharmacies, making it an easy brand to find. Selected Dove products include moisturiser properties, with sports and invisible varieties additionally available. Rated four stars for overall satisfaction, Dove was also rated four stars for value for money and effectiveness, while rated three stars for smell and packaging. Another brand that focuses on the ‘2-in-1’ deodorant and antiperspirant option, Rexona is an Australian name now owned by global consumer goods company Unilever. Whether you’re looking for a standard day-to-day deodorant, or something to help keep you smelling like a daisy on the sports field, Rexona is likely to have you covered. Available at supermarkets and pharmacies, Rexona’s aerosols come in 250ml cannisters, while roll-ons are available in 50ml packages, making them handy for when you’re travelling. Other Rexona varieties include sensitive skin, antibacterial and stain-free. Rated three stars overall, Rexona was also got three stars for all remaining categories, including effectiveness and value for money. A big hitter in the personal hygiene space, German brand Nivea offers a number of deodorant products, including roll-ons and aerosols. As with most brands in this list, Nivea’s products are primarily the 2-in-1 deodorant and antiperspirant combination, but with some products offering additional benefits such as stain protection and antibacterial benefits, along with products for those with sensitive skin. Available to buy from your local supermarket and pharmacy, roll-ons generally come in 50ml sizes, while the aerosol cans are usually 250ml, although you will have to look elsewhere if you’re looking for a variety of scents. While scoring a four-star rating for value for money, Nivea was rated three stars across all other categories, including smell and overall satisfaction. Operating under the Pharmacare brand, Norsca may not offer the range of other brands, but provides a number of deodorants and 2-in-1 options for consumers to pick from, including the Adrenalin range for sporty types, as well as the ‘Forest Fresh’ range for those looking for that natural smell. Its roll-ons are typically available in 50g packages, with aerosols available in 245ml, both sold at selected supermarkets and pharmacies. Norsca was rated three stars across all research categories, including overall satisfaction. One of the better-known brands when it comes to deodorants, if you’re looking for a variety of different scents, Lynx may well be the one for you. Offering plenty of personal care and grooming products, Lynx’s range includes separate deodorants and antiperspirants, plus cologne-styled fragrances for when you’re looking to mix it up. Easily found in supermarkets and pharmacies the world over, Lynx’s deodorants are available in 155ml aerosol cans, with roll-ons additionally available. Rounding out the results, Lynx scored three stars for overall satisfaction, effectiveness and value for money, but scored four-star ratings for smell and packaging. Canstar Blue surveyed 3,011 Australian adults across a range of categories to measure and track customer satisfaction, via ISO 26362 accredited research panels managed by Qualtrics. The outcomes reported are the results from customers within the survey group who have purchased and used men’s deodorant from a supermarket or pharmacy (excluding body spray and perfumes) in the last 3 months – in this case, 963 people.